Cayman Breeze is a luxury 2 bedroom, 2 bath condo directly on the ocean, located on Multi-Million Dollar Row, on the Northside of Grand Cayman. It's located in the North Pointe Condominiums complex in beautiful Cayman Kai near Rum Point ! The condo has complimentary Wireless, High Speed Internet DSL for our Mobile Guests ! In addition, you have Unlimited Vonage phone for International Calling to/from Grand Cayman to the US and Canada, at no additional charge! The North Pointe condominiums were destroyed by hurricane Ivan in September, 2004 and have been completely rebuilt from the ground up, with new occupancy July, 2006. Our new construction consists of solid poured concrete walls and standing seam metal roof. The construction provides an additional benefit of total soundproofing to insure a very quiet setting. The condo is located on the 2nd floor of the complex on the private eastern corner, end unit. Your neighbors next door are lovely palms and grape trees which are home to several native Cayman parrots who cheerfully greet you each morning. Our condo is uniquely positioned in the complex at the tip of North Pointe and draws in a constant cooling breeze off the ocean, thus the natural choice of the name 'Cayman Breeze.' You can open the 3 sliding glass doors opening out to the oceanfront lanai and enjoy a wonderful breeze throughout the condo. Or of course you can set the central AC on the temperature of your choice. The condo offers spectacular oceanfront views from the large open air lanai, as well as oceanfront views from the living area, and the master bedroom. Awaking in your 4 poster king size bed and watching the ocean and listening to the lapping waters on the beach is to die for. We have appointed Cayman Breeze with the very best of upscale furnishings, appliances and amenities. The two bedrooms have luxurious king size beds in the Serengetti design, with top-of-the-line pillow top mattresses, and 600 thread count linen sheets. The living area is furnished with a super soft and comfortable leather couch and loveseat. The couch is a full size queen sleeper, and the condo can comfortably sleep up to 6 adults. The master bathroom has a full size tub and the guest bathroom has a large walk-in shower. The kitchen is smartly decorated stocked with a full size refrigerator/freezer, full size dishwasher, large microwave and full size stove and oven. The kitchen is equipped with stylish dishware, glasses, wine glasses, martini shaker, blender, toaster, coffee maker, mixer and cutlery. All of the counter tops are beautiful granite with Kohler sinks and hardware. Every room features designer ceiling fans and the living area has a TwinStar, dual fan for a unique look and functionality. The master bedroom has a 4 poster bed, full dresser with mirror. There is also a computer desk in the master bedroom for those laptop travelers, and complimentary high speed wireless DSL internet. Plus the added bonus is the VONAGE phone, which allows you free unlimited international calling. If you are needing to stay in touch with your office or family on a daily basis, this feature will save you hundreds in long distance charges. The lanai is smartly decorated with an outdoor dining table and 4 chairs and a lounger overlooking the ocean and beach. Take the private stairs down the back of the condo off of the lanai and stroll down to the beach or around to the large freshwater pool. The pool also has a shallow pool perfect for small children. The snorkeling right off the condo and all along the northshore in Cayman Kai is the best on Grand Cayman. The reefs start in about 5 feet of water and extend out to about 25 feet and are loaded with reef fish, plus you'll see large mature conch, varying sizes of lobsters and an occasional octopus. The water in front of the condo is natural landscape. The beach itself is all white sand, but can be rocky as you enter the water. swim shoes recommended. 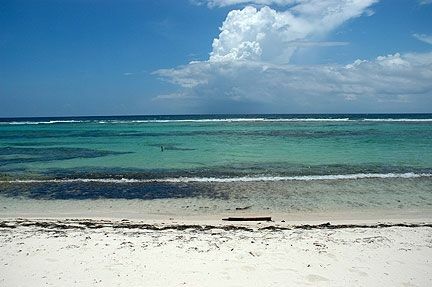 we have great snorkeling, but it is not appropriate for recreational swimming (too shallow, with areas of sea grass, ledges, and rocks).Rum Point beach, just down the road is better for swimming. For scuba divers, we highly recommend Ocean Frontiers, a 15 minute drive in East End. This world class dive operation features personalized service, small dive groups and the best diving sites on Grand Cayman. We stayed with another couple here and couldn't have enjoyed it more! The location is perfect on the North Side where you don't have to deal with all the crowds. The beach was fantastic for snorkeling and close to Rum Point and Cayman Kai Public Beach. We found some good restaurants we enjoyed in the area for dinner but there was no pressure to have to find meals out if we preferred to just relax and eat at the condo. The unit is very clean, well-stocked, and overlooks a totally private view of the ocean from the lanai. The bedrooms were quite comparable with private baths so each couple had their privacy. We were close to Rum Point and the Botanic Gardens, which we all enjoyed. This was one of the most relaxing vacations we've ever experienced and can't wait to do it again! Pictured is our daughter Kimmy standing on the beach at the condo. We both grow up in the midwest and longed for a warmer climate to get a break (even a week) from the snow and cold of winter. My family and I have been coming to Grand Cayman for several years. After visiting other islands in the Caribbean and Mexico, we easily decided this was the best place based on friendly people, Great food, up-scale location and the important factors of island stability, safety and security. Cayman Breeze is fully licensed with the Cayman Islands Department of Tourism. both bedrooms are well appointed with ceiling fans and king size beds. The place is absolutely perfect. Very clean inside and out, which is very important to me . Pool is thee cleanest pool I have ever been in . Only suggestion would be to put more pictures on the listing . I was initially aprehensive because there were only a few pictures. The place exceeded my expectations . Just finished an extended stay at the quiet North Pointe condo in the Cayman Breeze unit. Helpful and responsive communications with the owner was excellent before and during our pleasurable time at the condo and on the island. The condo is situated on the north side of the island away from the hubbub of the cruisers on Seven Mile Beach. Popular attractions—Rum Point, Starfish Point, Queens Botanical Garden , Stingray City and Caves—are a very few minutes away. The East End with a Foster’s IGA Grocery Store, wines/spirits store and good selection of restaurants is a picturesque and hassle free 15 minute drive. Chisholm’s general type well stocked grocery convenience store is 5 minutes away. A car is a must for most of the island. The second story condo was ideally situated on the northeast side of the building—avoiding the heat of the afternoon—facing the coconut tree lined white sand beach a stone’s throw from the ocean. The spacious lanai offered beautiful ocean views and became our permanent great room. The condo and our unit was clean and comfortable with a well maintained pool and property. This was our first trip to Grand Cayman, it won't be our last. This property is just as presented, it is comfortable and unlike some places we have visited, everything here actually worked! The location is convenient to Rum Pt/Northside attractions & restaurants. Neighbors were polite & informative regarding 'where to/when to'. The pool was a blessing, considering the vast amount of sargassum weed in the water & on the beach. We are not into the George Town scene, so we appreciated the relative remoteness of North Pointe. Although the road is close to the property, the traffic noise was not a factor (and we spent most of the days outdoors at the pool). We normally vacation on the 'out islands' of the Bahamas & Grand Cayman was a needed break & a welcomed find. We hope to return shortly. We loved this condo and the remoteness made it feel more of an island. Definitely must rent a car and be comfortable driving as if you are on mr toads wild ride!!! Thanks for the stay. We love the Rum Point side of the island, it really does have that great island feel. Traffic near Georgetown can be busy, while the northside/Rum Point area is away from the crowds and traffic. Hope to see you again. Fed Cayman the cat! Loved the pool! Glad you liked the pool, we love it too, right on the ocean. The Rum Point area is quiet and has something to do for everyone, such as great restaurants, beaches, Stingray city, Starfish Point, SCUBA and snorkeling. Thanks again for the stay. Beautiful and out of the way from the busy Seven Mile Beach area. Beautiful snorkeling right outside the condo. There was seaweed in the ocean and on the beach when we arrived. Luckily a local we met at Rum Point explained it was not a normal occurrence. Just had to get through it and crystal clear waters. The only negative on the condo was the pull-out sofa. Don’t count on it for bed space - very uncomfortable, sloped downhill, and had lump in mattress where folded up. Would definitely come back. It's always great hearing from our guests. Glad you liked the snorkeling.